A rational function can be written in the form f(x) = p(x)/q(x) where p(x) and q(x) are polynomial functions. 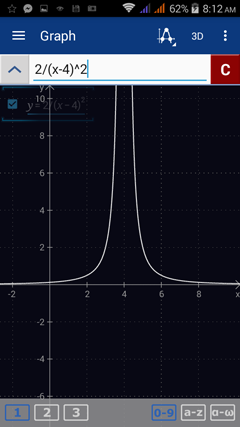 It can be defined at all values of x except when q(x) = 0 where the the graph either has a hole or an asymptote. 1) If the equation is defined explicitly i.e. "y =," enter only the rational expression with the numerator and denominator in parentheses and use the fraction key ( / ) to separate them. Sketch the graphs of the following rational functions. 1) Enter the expression: 2/(x -4)^2. Hit enter. 2) Enter the expression: (x + 2)/(2x - 6). Check the box next to each function to display the discontinuities. To look the graphs separately, enter each equation on a separate workspace.